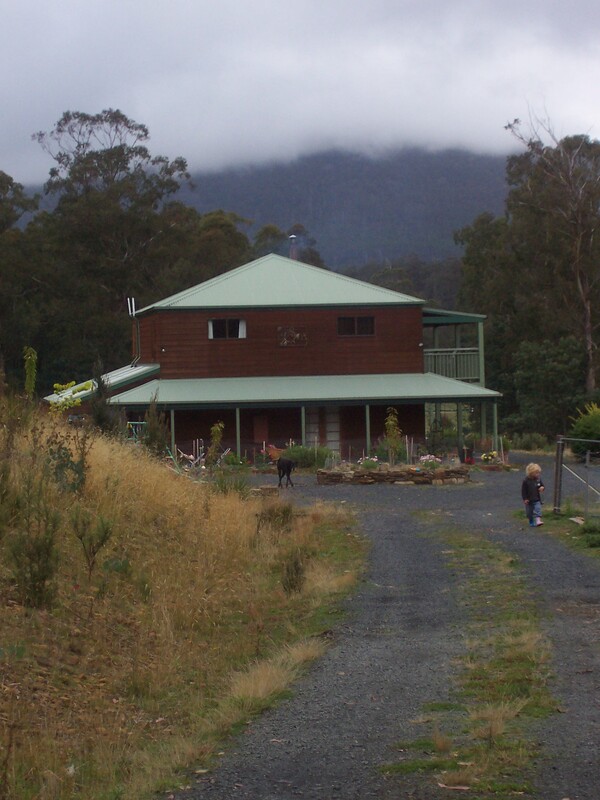 This could rank as one of the hardest weeks we have had at the Little Tassie Prepper home. Last week I came home from work and Kitty told me that she felt terrible and she needed to rest. She said that her back hurt, she felt sick, and she was in a lot of pain in her chest. I warmed up some wheat bags for her back, then went to work on finishing the dinner she had started for us. Half an hour later, Kitty told me that she felt worse and needed to see a doctor. It was after business hours by now, so I mentioned that I would have to take her to the emergency room at the hospital. She said that would have to do, so she went to get changed for leaving the house. I set about serving the kids their dinner, so the kids could be fed before we went to the hospital. A couple of minutes later Kitty asked me to call an Ambulance. She said she needed to go to the hospital now. Her skin looked yellowish, and she appeared to be in a great deal of pain. I called immediately, and after answering a couple of questions from the dispatcher, the Ambulance was on it’s way to us. Thirty minutes later, the Ambulance arrived. They bustled in and began their checks on Kitty. After a little while they confirmed that it wasn’t anything to do with her heart, so that was a relief. They ran a quick check on her blood and found it a little off, so they recommended that they take her to the hospital for the doctors to check. They asked if we would like her to go to Private or Public. As we have Private Health insurance we decided on Private. Kitty left for the Hospital and the next morning I went to check on her. The next day we discovered that our Private Health coverage did not cover this type of situation. Kitty transferred to the Public Hospital and we started the waiting game. Kitty apparently needed to have her Gall Bladder removed, yet they also needed to check her Liver as the Gall stones may have blocked her Liver. Every day the doctors would come and tell her that she would have surgery tomorrow. The next day would come and they would postpone it to the next day. This was apparently due to budget cuts to the hospital, allowing only 1/2 the number of surgeries to be used. In addition, last week was the Annual Scientific Congress which was held in Singapore, meaning that nearly every surgeon in Australia was not available. On a side note, how stupid is it to have most of the Australian Surgeons in one place? That would be a tempting target to anyone wishing us harm. Last night, Kitty finally had the surgery, so she is recovering. This week has taught me many things. I had meant to look at our health coverage ever since I listened to the Survival Podcast episode with Jason Adkins. As soon Kitty comes out of Hospital I will look at this. The doctors at the hospital said that this is becoming more common, that people thought they were covered, yet it turns out they are not. Apparently every day someone in our hospital has this happen. Kitty’s mobile phone became wet a while ago and stopped working. We intended to get a new one, yet were not able to find the time. I lost my mobile phone last week. Not having this made it a lot harder to keep in touch with each other. There is no phone in Kitty’s hospital room, so it is very hard to contact each other. In our house, Kitty usually does the laundry. This was her choice. She decided that as she is better at it than I, she would do the laundry and I do something else at which I am better. Not having Kitty home has meant I have had to learn how to use our washing machine. It took a few tries, yet I have it down now. I will finalise the posting on propagating cuttings later this week. I need to add a note, that I forgot to mention in the original post above. I have also had a good experience from this, with many people who I know have really stood beside us this week. Many friends have come out and offered help and support. People have offered to look after our children to allow me to go see Kitty in the hospital. Some close friends made us a delicious dinner, so that I would not have to cook one night. I am seeing the members of my community come together to support my family, which is very touching. 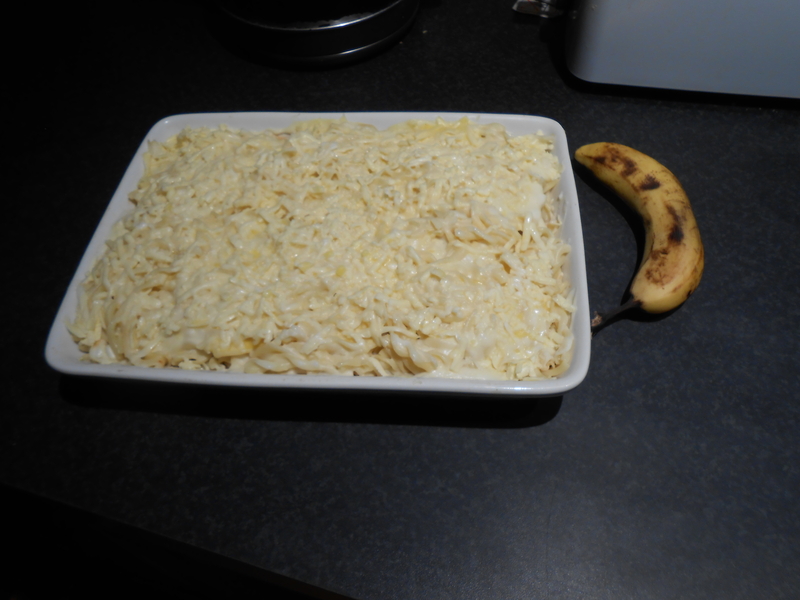 Here is the mince and pasta dish which one of our friends gave to us. It has not yet been heated in the oven. Banana for scale.